If you experience a burning sensation in your eyes, which is accompanied by a discharge, and itchiness, it could mean that you have an infection. When these two symptoms occur together, it means that you may have a foreign object in your eyes, or you may have sustained eye trauma recently. It could also be an indication of an allergic reaction. What should you do when you suffer such a symptom? What is an itchy tear duct? How does your tear drainage system function? Tear duct infection and blockage can lead to inflammation. Tear ducts, also known as nasolacrimal ducts in medical terms are the tiny canals found in your eyes, which make it possible for ear drops to be drained from your eyes and into the nasal cavity. However, you need not worry much, as there are a number of readily available natural treatments and home remedies, which come highly recommended in the management and treatment for red, inflamed tear ducts thanks to their efficacy. When many children come into this world, they often have obstructed tear ducts. Their tear drainage systems may not have become fully developed, or their ducts could have an abnormality. In many cases, the blockage is caused by a remaining thin tissue, which has remained over the opening that is supposed to empty into the nasolacrimal duct. An allergic reaction to dust, pollen, etc. could lead to an irritation of your eye, which could be accompanied by symptoms associated with the upper respiratory tract system. When they are in your body, the allergens stimulate immunoglobulins production that the results in an inflammatory response leading to itching and irritation of your tear ducts. Certain food allergies together with seasonal allergies have been known to be the main culprits for this kind of reaction. It is a condition that affects close to ten million people in America. Dry eye syndrome is characterized by reduced production of tears by the ducts that are in your eyes, and this leads to eye dryness, which then causes the irritation and itching. As you grow older, puncta (these are the tiny openings in your eyes, which drain your tears) are likely to start becoming narrow, and this may lead to a blockage in the tear ducts, and this then leads to an itching duct. When you sustain and injury to your face, it may cause scarring or bone damage close to your drainage system, and this is likely to disrupt the normal tears flow through your tear ducts. Additionally, the presence of loose skin cells or small particles that have become lodged in your duct could also cause a blockage to occur. One of the most common infections associated with an itchy tear duct in one eye is conjunctivitis. It is an infection that could result in an inflammatory response that is likely to lead to itching and irritation of your eyes as well as tear ducts. The presence of a tumor along your tear drainage system or even in the nose may also lead to the tear ducts becoming blocked. A blocked or swollen itchy tear duct is one of the many possible side effects that are associated with radiation and treatment and chemical medication used for cancer patients. Your tears are produced by the lacrimal glands, which are located in the inner part of your lids above both eyes. Typically, the tears should flow from these glands after production and over your eye surface. They should then proceed to drain into the puncta, which is found in the inner corners of both the lower and upper eyelids. The eyelids in human eyes contain small canals referred to as canaliculi, which are responsible for moving these tears into a tiny sac where your lids are attached to the lacrimal sac (side of your nose). Once they get into your nose, they become reabsorbed. Obstructions can take part at any point along this drainage system that runs all the way from the puncta to the side of your nose. In case this happens, the tears will not be able to drain in a proper manner, and this will lead to watery eyes, which may then increase your chances of getting an infection or a swollen itchy tear duct in one eye. Previous surgery—if you had a previous sinus, eyelid, eye, or nasal surgery, it may have caused scarring to occur in your duct system, and this may have led to the development of a blockage later on. Previous cancer treatment—in case you have undergone chemotherapy or radiation treatment used in treating cancer, you will be at a higher risk of getting this problem, more so if the treatment was focused on your head or face. Chronic eye inflammation—a person who has eyes that are continuously red, inflamed, and irritated, which are all symptoms associated with conjunctivitis will also have increased chances of developing swollen tear ducts. Glaucoma—the anti-glaucoma topical medications are traditionally used on a single eye. Therefore, having used any topical eye medications, including the anti-glaucoma medications will place you at a higher risk of getting such a problem. 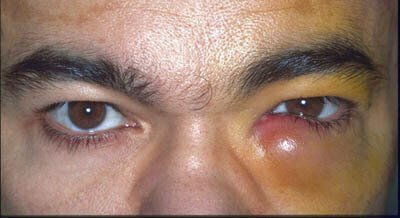 Dacryocystitis is the term given to an eye tear duct infection or a tear occurring in the lacrimal sac. As mentioned earlier, in each eyelid, there is an opening to the tear duct present in each inner corner. The tubes function is to transport away tears that have already been used to rinse the front eye surface making it possible for fresh tears to enter, even though the tears coming into the nose cannot be seen. It is probable for your tear duct to get infected if bacteria start to collect in the lacrimal sac or in the ducts or if it becomes blocked. It is also possible for a blockage that has occurred close to your nose to cause excessive tears from your eyes. Even though it is possible for an infection of the tear duct to occur in any age group, they tend to be common in small children who have an inborn nasolacrimal duct obstruction. A child that has been born with this problem will often have a narrow passageway, which may start to widen as time goes by. Many children that have been born with this particular disorder are able to outgrow it by the time they are twelve months old. An adult getting a tear duct infection means that the ducts may have become unusually constricted by the continuing growth of the bones surrounding it. Ducts tend to be more rigid, making them less able to eliminate the debris that is likely to cause an obstruction. It is also possible for a duct to become blocked after you have sustained trauma to your eyes or nose e.g. a damaged nasal polyp or broken nose. When the infection first occurs, it is referred to as acute dacryocystitis. When the conventional tear drainage system is blocked, or when you end up producing too many tears, the eyes tend to become a little watery. This tears influx may end up spilling over onto your cheeks and eyelids, which will make it appear as though you are shedding tears. Depending on what has caused it, there is always something that you can be able to do to put an end to it. Tears are vital for lubrication and nourishment of your eye, and anytime you blink, you are essentially washing the eyes with the tears that have been produced by the glands located in the upper eyelids. Your lacrimal glands are in a position to produce more tears as a reaction response to inflammation and irritation. In many cases, watery eyes tend to be a symptom as opposed to being one of the causes of eye distress. Certainly, they can be quite annoying to deal with, but, if they are not accompanied by redness or pain, the excess production of tears should not be viewed as a big problem. Almost each person will at one time have to deal with a case of itchy red eyes. Itchy eyes have very many causes, and often, the problem is always accompanied by eyelids that are itchy at the base, as well as red eyes, and swollen eyelids. Medically, itchy eyes are referred to as ocular pruritus. What causes itchy red eyes? In almost all cases, allergies are the main course of the itchy red eyes. Here, an irritant e.g. animal dander, dust, or pollen causes histamines (a compound) to be released into the eye tissues resulting in swelling, redness, and itchiness. They frequently cause an allergic reaction referred to as conjunctivitis. This particular eye allergy is very common during the spring and fall seasons. Its main cause is exposure to allergens found in the outdoors e.g. weeds and grass as well as high pollen counts. As the name suggests, perennial eye allergies are present throughout the year and are primarily caused by factors such as dust and mold. It is also possible to get itchy eyes due to a product that you may be using currently. For instance, some individuals develop an allergic reaction to the contact lens solutions that they could be using at the moment. However, you should note that an allergic reaction may not be the only cause of itchy eyes. If you notice that you are feeling a burn, the cause could be Meibomian gland dysfunction or dry eye syndrome. Given the fact that there are so many causes of itchy red eyes; if you notice that your symptoms are lasting longer than expected, or if they refuse to subside when the allergy season comes to an end, you should visit your doctor to consult for the treatment of red, inflamed tear ducts. For babies that have been born with congenital blocked tear ducts, they often improve on their own during the first few months after their drainage systems have matured. There are cases where the ophthalmologist could recommend the use of a unique massage technique that assists in opening up the tissues that shield the lower entrance to the baby’s nose. For blocked tear ducts that occur after sustaining a facial injury, your drainage system should start to work again within a few months after first sustaining the injury. In most cases, you do not require to undergo any additional treatment. But, if this does not happen after you have waited a few months, your eye doctor could recommend that you undergo surgery to rectify this problem. This is a technique that can be used on both babies and adults. For babies, is recommended when the massage fails to open up the tear ducts that are blocked, and which have refused to open up on their own, even after using the massage technique. In the case of an adult, it is recommended when a duct is partially blocked or when you have a fractional narrowing of your puncta. Your doctor will use an instrument to dilate (enlarge) your puncta openings. He or she will then guide a narrow probe via your puncta, through your tear drainage system, into your nasal opening and then remove it. Your drainage system will then be flushed using a saline solution, which is intended to remove any remaining blockages. The procedure is used to open up tear drainage passes, which have been blocked or narrowed by inflammation or scarring. Before the procedure, a general anesthesia will first be administered. A tube containing a deflated balloon at the tip will then be guided over your inferior nasolacrimal duct. A pump is then used to inflate and deflate this balloon. An itchy tear duct can pose a number of problems if left untreated. But, if you are not ready to visit a doctor yet, you can always try out the following home remedies, which will assist in reducing the symptoms that you are experiencing. It is a practical and easy to use home remedy when dealing with a case of conjunctivitis. Blood circulation will be enhanced by the heat coming from the warm compress, and will in the process promote and enhance eye healing. Additionally, it assists in reducing inflammation, pain, as well as ensuring that you do not get an infection. A saline solution always comes in handy when you have an eye related problem. It can be used when dealing with an eye that is itchy, irritated, and inflamed. If you can, try and use distilled water, as tap water often contains impurities and chemicals. It can be used in reducing eye irritation as well as itching that has been caused by both bacterial and viral infections. Colloidal silver comes with very small particles that are suspended in water. When used as an eye drop, the small particles pick up all the infected cells as it attracts them electromagnetically. You could also choose to purchase the over the counter ointment, which is applied around the affected eyes. It is ideal for dealing with itchiness.